My name is Anthony (ARCoyne), I reside on the south side of Chicago. 50, male, single, ak amputee, MSW Social Worker/Clinical Therapist. I just ordered the Cecilio Solidwood Ebony Electric Violin CEVN-1 from FiddlerShop, and can't wait to get started on my violin journey. I have been playing guitar, bass, and drums on and off since I was a teen, and recently started learning keys. My new project (in progress) consists of compositions including strings and horns composed around percussion, guitar, bass, and keys. In the future I hope to incorporate the violin in my more orchestral/symphonic projects. Gear: Macbook Pro, Garageband, Monitors-M-Audio, Headphones/Ear Buds-Bose, AKG, Shure, Apogee Jam, iRig Keys, Guitars/Basses-PRS, Ovation, Fender, Gibson. I look forward to meeting musicians to learn from and share experiences while on my new violin journey. Thank you for your time and consideration. This quote is so right!!! Congratulations on your decision to learn to play the violin. You have a lot of musical experience which should aide you in learning quicker. We have quite a few guitarists on this forum. Sorry to hear about the limb loss. One leg or two? How do you get around? I checked out your music and really like it. Did you record all the parts yourself? Are they all your own compositions? Welcome > I listened to some of your tracks > good stuff > you seem to want to add more color with the violin from what I gather. That is why I started the viddle. Start practicing > you will like it. Thank you all for the warm welcome, much appreciated. Fiddlerman, just wanted to add that you are an inspiration, your videos are awesome, you show such finesse, passion, and expertise. I'm an ak right leg amputee (hell of a dancer, I might add, proficient in the one step and triangle dance, lol), ambulate via manual wheelchair at work, etc...and forearm crutches while at home. That you for the kind words about my music projects, always consider myself a novice wanting to improve and learn more, rock based/influenced. I'm interested in more musical genres such as jazz and classical, the passionate expressions touch me on a soulful level. All of my music is original, inspirations that come from people, experiences, and musical riffs/passages that I hear. I cannot read music yet, but I intend to learn while learning and growing with the violin. I turn 50 on the 16th, and my gift is the violin purchased from your site. Thank you for all that you do to inspire and teach. Great sites, plan to visit often. Welcome, Anthony! Nice to meet you and have you here. 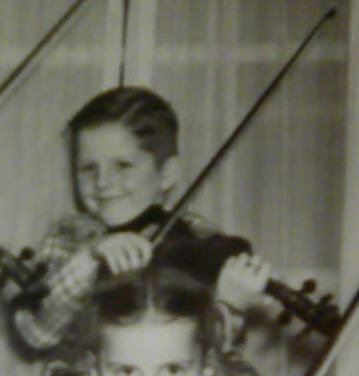 Good luck with your musical projects and keep us posted on your progress with the violin. Sounds great. Welcome to the 50 year old club too. I turned 51 last month.